What can personal stories tell us about a culture and way of living, and why are they important both as documents of the past and as stories about the present and future? Of course they are windows into a world we may not know, but they can also be a reflection of our own prejudices and taken for granted ways of being. They are also doors through which we can walk to understand another’s vision. The work of African filmmaker Ousmane Sembène and his biographer Samba Gadjigo are two important narratives that intersect through the powerful documentary Sembène! , co-directed by Gadjigo and Jason Silverman, a longtime writer and contributor to the Telluride Film Festival. 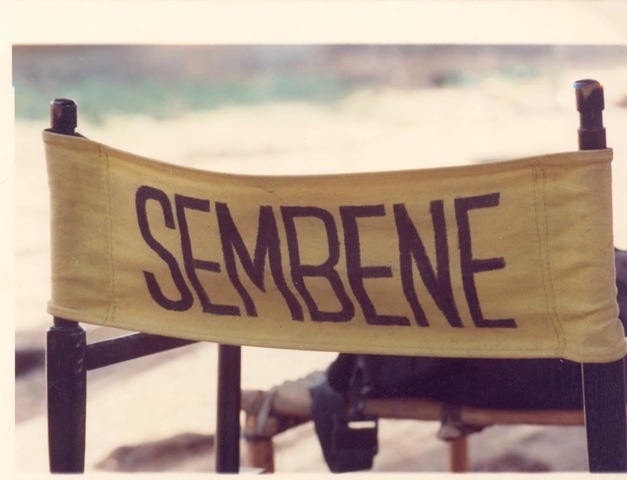 Just accepted into the 2015 Sundance Film Festival, Sembène! is in its final days of post-production and has a Kickstarter campaign that ends in just a few days—on December 16, 2014. I brought together several voices to talk about the importance of Sembene’s work. The role of storytelling, and the African griot tradition more specifically, is directly linked to the UC Berkeley campus and Peter Sellars. It was here (during my own graduate studies of art and identity in post-colonial Jamaica) that I took both his Art as Social Action and Invisible Worlds classes. 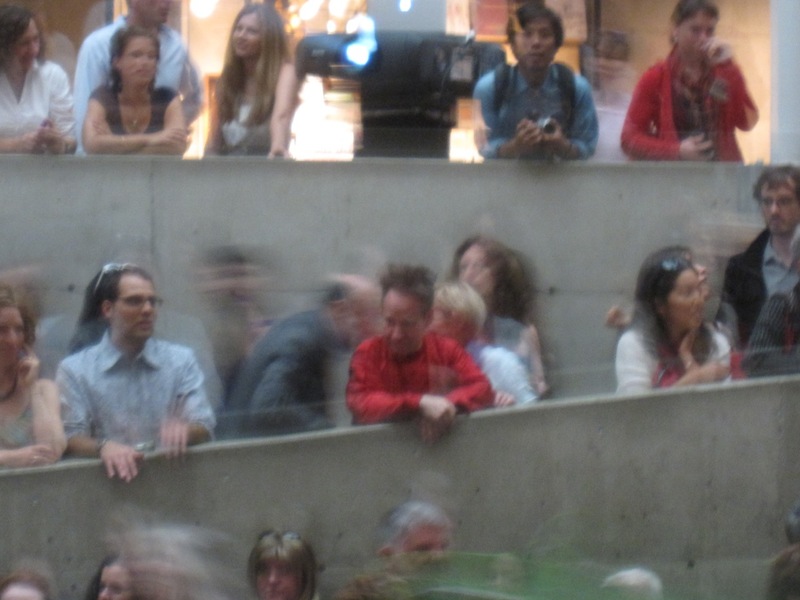 In Invisible Worlds, each week we imagined and created mini performances based on Buddhist sutras. 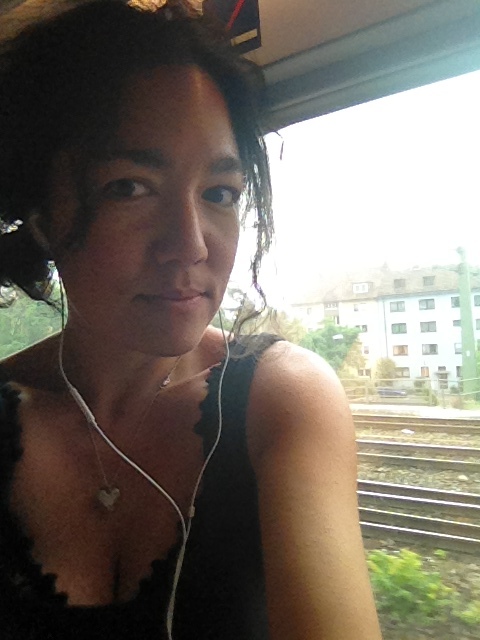 At that same time I learned about the various roles of oral, visual and textual storytelling in Africa (Salif Keita, Baaba Maal, Youssou N’dour), China (Peter’s opera The Peony Pavillion ), Europe (Pina Bausch) and Vietnam (through my professor Trinh T. Minh-ha), and the power of the documentary form more generally (through professor B. Ruby Rich). Many of these interactions happened through Zellerbach performances, but just as many happened through classroom screenings of films and especially screenings of rare prints at Berkeley’s Pacific Film Archive. Although I came late to experiencing Ousmane Sembène’s films, they can be traced to the Pacific Film Archive in the ’70s. It was here that my friend and mentor Tom Luddy, who was the director of the PFA (and co-founded Telluride Film Festival), introduced the Bay Area to Sembène’s work. Dusan Makavejev, Angela Davis, Ousmane Sembène and Alice Waters at Chez Panisse. “He’s one of the greats—a major writer and a great director,” Tom recollected in a phone conversation last week. 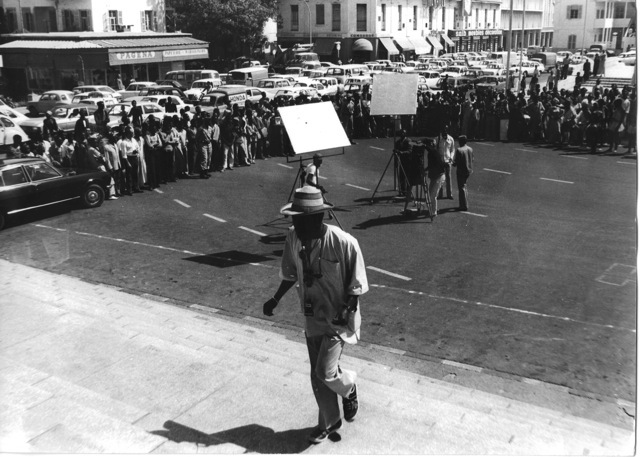 “I brought Sembène and three or four other filmmakers from Senegal to the PFA in the mid-’70s. I did a whole series. I asked Angela Davis to be a translator and she was thrilled. He stayed for several screenings. I even took him to Oakland Tech for an Outreach program. (Another time I took [Roberto] Rossellini there.) And I remember taking him to Chez Panisse. In those days I often had four or five filmmakers a week passing through town, and we always went to Chez Panisse, where Alice was such a gracious host. Then in the ’90s we had a reunion dinner when Sembène was here for the San Francisco International Film Festival, with Alice, Angela Davis and Dusan Makavejev, who was in town. 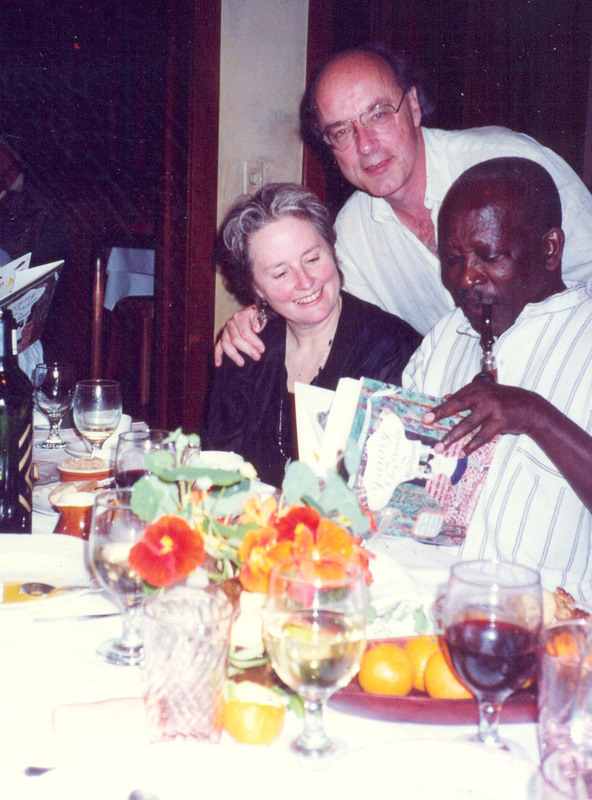 Tom Luddy, Alice Waters and Ousmane Sembène reading Fanny at Chez Panisse . Milos Stehlik, director and cofounder of Chicago’s Facets, on the relevancy of Sembène’s work: “No filmmaker in the world weaves together with both pathos and irony the damning effects of colonialism on ordinary lives. Sembène invented a third reason for cinema to exist—not for ideology or profit, but to communicate with people who couldn’t read. 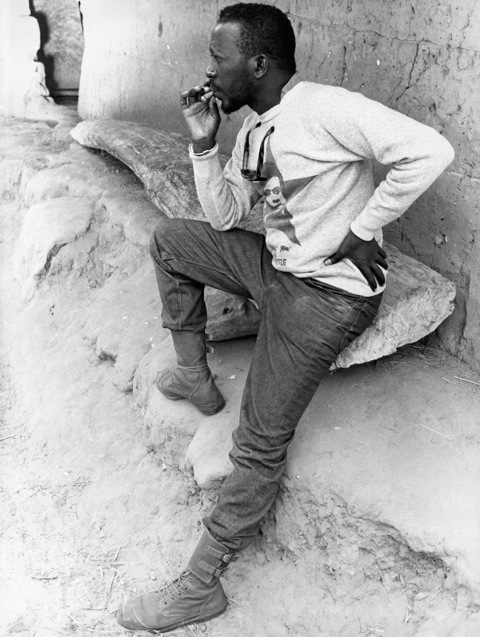 It’s one reason why his films are timeless, and why the issues which Sembène’s films bring up will speak to every generation in every country, for as long as there is injustice, racism, fundamentalism, corruption, inequality…. 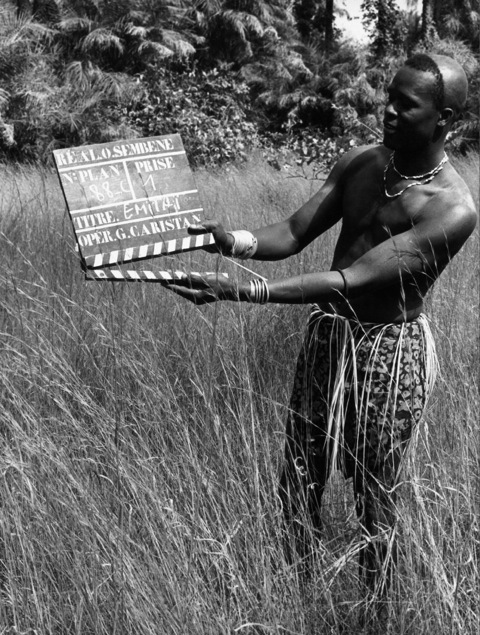 Ousmane Sembène on the set of Moolade , 2004. “I met Samba Gadjigo through the Telluride Film Festival, where we premiered Moolaadé in 2004. 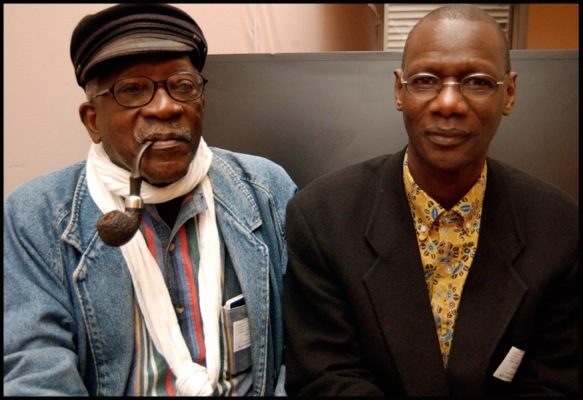 Samba is Sembène’s biographer, and wrote a piece for the festival that caught my attention. Sembène’s personal life was astonishing: He was a dockworker, self-educated, who began writing novels for the African working class. Then, in the context of West Africa, where filmmaking for Africans had been illegal, he taught himself how to make films. That in itself is an incredible story. 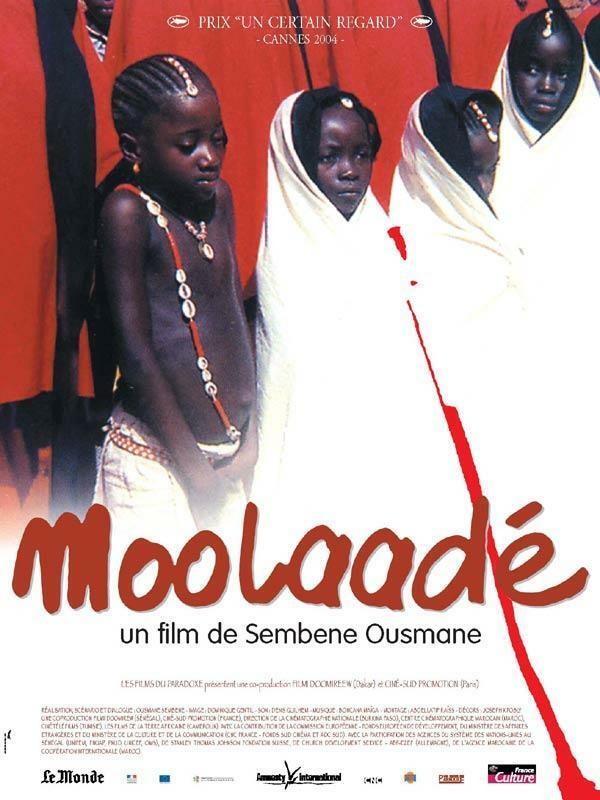 But I saw Moolaadé , which is truly a masterpiece of cinema, and I became obsessed. Samba and I began working together curating African cinema soon after, and then we began talking about a film. “Though I love movies, I’m more concerned with the ways in which stories shape how we know the world, and the movies have been used as an ideological tool almost since their creation. (Tarkovsky said cinema was ‘born in sin.’) I admire anyone who uses film as a way to confront the commodity culture, rather than reinforce it—to tell stories of connection and beauty, to use the camera as a means of resistance or revolution, to deepen and motivate us in a progressive way. Historically, its an incredibly capital-intensive and technically difficult medium, so people working outside the system and making films of meaning, particularly before digital video, are real heroes. Sembène immediately jumped to the top of the list of artists doing that kind of work when I saw Moolaadé . Here was a film of intention and meaning and beauty, clearly made outside any system, and both motivated by positive social change and truly, deeply, beautiful and moving. Seeing my first Sembène film was a radicalizing moment. 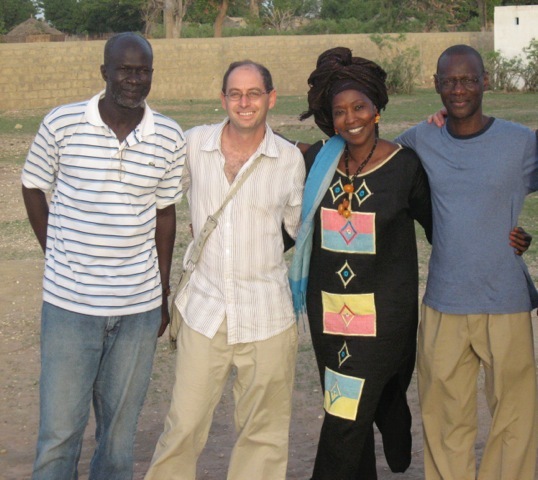 Makhete Diallo (technician on Sembène’s films), Jason Silverman, Fatoumatah Coulibaly (lead actress in Moolaade ), and Samba Gadjigo. It is through stories—whether through film or food, text, music, dance, or opera, that we connect to other people and other cultures. Just like Ousmane’s book God’s Bits of Wood and film Moolaadé have inspired Samba, the opera, film and food worlds created by my mentors Peter Sellars, Tom Luddy and Alice Waters hold a dear place in my heart. They have been transformative to many. 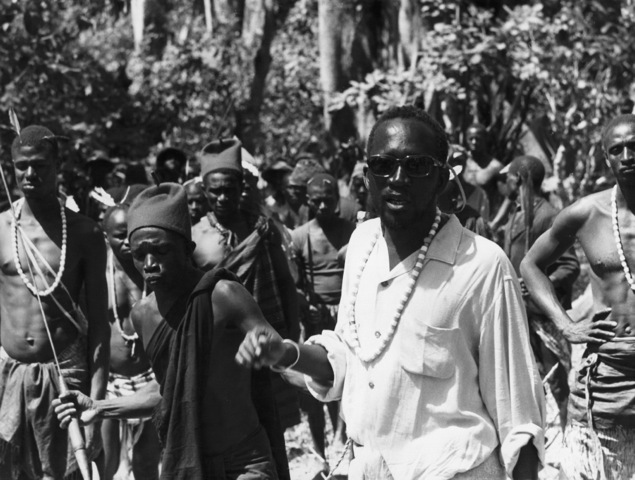 Please support this project and help bring Samba’s story of Ousmane Sembène to life. 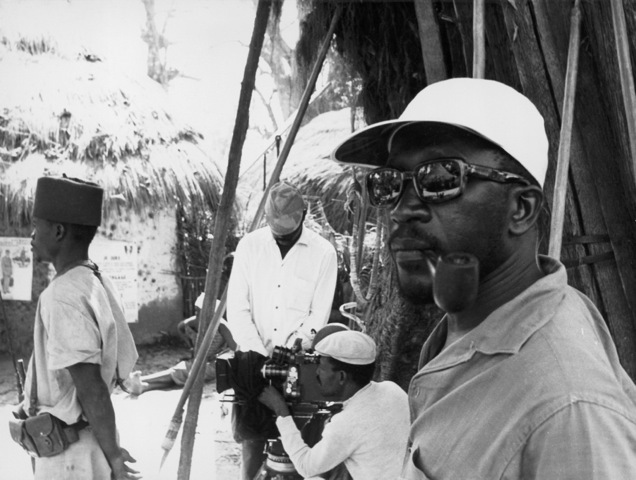 Click here to find out more about Sembène! and contribute to the film’s Kickstarter campaign. 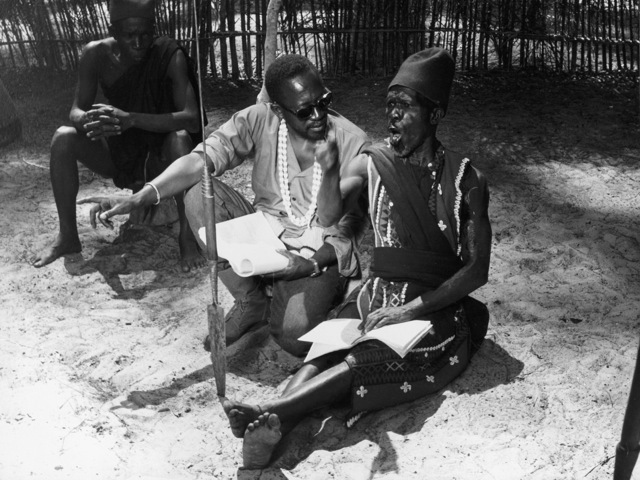 Besides Moolaadé, Ousmane Sembène leaves behind a wide body of work in films and books. We encourage you to seek them out at your local independent bookseller, but you will also find them and books about him at our Indiebound and Amazon affiliate links. This entry was posted in Uncategorized and tagged African film, Cari Borja, director, documentary, Films, Moolaade, Ousmane Sembène. Bookmark the permalink.